It's funny, but I feel a bit strange about "coming out" with this. I have been making/using my own deodorant. There—I said it. It's true! Are you shocked? But, the truth is, I don't stink! I really don't! I began this journey back in August, when we bought our first house, and were trying to cut corners in some areas. I had been curious about the homemade deodorant thing for a long time, but just had not found the guts to actually do it. I admit, it started as a motivation to save money. However I have also been uncomfortable with the links between aluminum found in most antiperspirants/deodorants and cancer, as well as the warnings about not allowing infants to inhale your deodorant when breast-feeding. So, all of that was enough for me to consider the idea. But, I was still having a hard time actually making the mental jump to actually following-through. Then, I read "Follow-Up: The Simple Organic Natural Deodorant Challenge" from Simple Organic. I'm a fan of that site, if you can't tell from my other mentions of it. This was a turning point for me. I really identified with her—I felt like making your own deodorant just wasn't me. I'm just not like that! I had tried other "natural" deodorants, and they were ok, but not great. So, Katie convinced me to try the homemade route. It seemed easy enough to make, so why not? I used the same homemade natural deodorant recipe that she links to in the article. 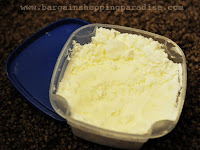 I decided to use cornstarch instead of arrowroot powder, since I didn't have arrowroot powder on hand, But, I did have to go out and get some coconut oil, which I found easily enough at my local grocery store. It was super easy! You literally just mix all the ingredients together, and viola . . . homemade deodorant! It does smell good, too. It makes me think of the beach. Mmmm! I also had to get over the fact that I needed to apply it with my hands. There was just something about it that didn't seem right! But, I kept reminding myself that I was dealing with coconut oil, cornstarch, and baking soda—no big deal! I can do this! So, I started using it just before we moved. I thought that would be a good test, since I knew I'd be working hard and doing a lot of sweating and running around. I may have been seen smelling my armpits a bit more frequently during that time, simply out of paranoia, but it seemed to be working just fine. Even after all that work, I didn't stink! But, I still wanted to give it some time, just to make sure it worked. Now, four months later, I'm still using it, and it's still working! That first batch lasted through the beginning of December, and I just made a new batch about two weeks ago. I believe that conventional deodorant would typically last me about three months. The only cost was the $9.99 for the organic coconut oil. The jar is huge, and I feel like I hardly made a dent in it so far, since the recipe only calls for 5-6 Tbsp. It will take me a long time to go through it. I had plenty of cornstarch and baking soda on hand, so those ingredients did not cost me a dime. The only downside I found—yes, only one—is that you have to be careful about white streaks on the outside of your clothes. But, you have to watch out for that with most mainstream deodorants, as well, so it's really just the same problem you have to watch out for anyway. I have been very curious about this but hesitant to try making my own deo. Thanks for the info and the recipe review. I also wonder about making my own laundry detergent. Do you do that too? YAY! I am so excited. I have been making my own shampoo(body wash), conditioner, and sometimes laundry detergant but I was worried to try the deoderant thing. I already have the coconut oil because I wash my face with it(sounds weird but it works really good). I am so going to do this. Thank you for sharing. You've inspired me. Interesting! I once received a sample of Tom's natural deodorant but it felt like a grease slick in my armpits. I ended up putting baby powder on top of it b/c it felt so gross, like I buttered my armpits or something!